What is an American Pale Ale? Better yet, what is a Belgian American Pale Ale? When will this insanity stop? We should just start calling beers with crazy varietal names by something completely arbitrary so that it no one is any more confused by sign posts like pale ale or porter or stout or pumpkin peach ale. This beer will surprise you at a somewhat boozy 6.8% ABV. Even more surprising is that it drinks a lot more balanced than its middling 35 IBU would lead you to believe. Dry hopped with Citra and Cascade hops there is the presence of hop resins and aromas that do not contribute to the bitterness and help in balancing out the beer’s alcohol. A Little Crazy is definitely “malt forward,” which accounts for the Belgian in its name. The brewery says that it is golden in color, but I would aim for a little darker hue like copper or amber when describing this particular brew. It is also carbonated a little lighter than more common American Pale Ales, which again I think contributes to its Belgian character. There is definitely some old world influence on this hybrid. 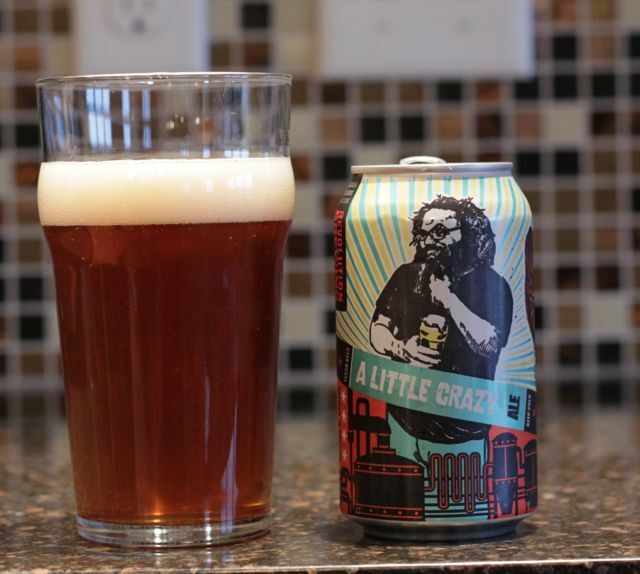 See what others are saying about Revolution Brewing A Little Crazy at Beeradvocate. 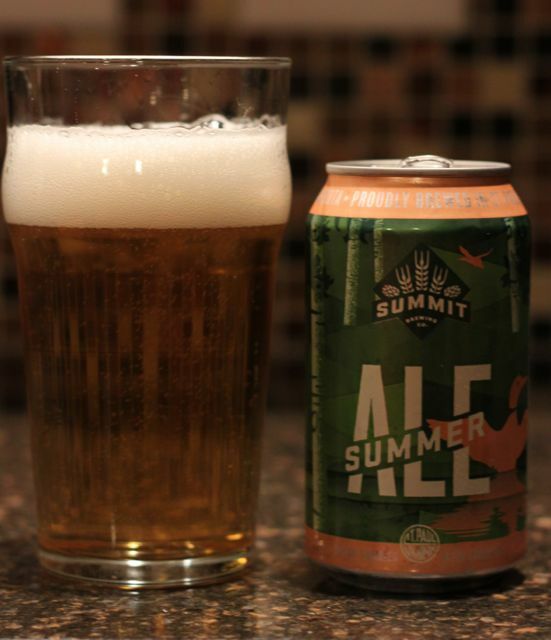 The beers of Summit Brewing have a special place in my heart. I went to college in the state of Minnesota and it is in college where my taste in beer truly evolved. Some would say devolved when witnessing my love of cheap American lagers on hot summer days, but I digress. 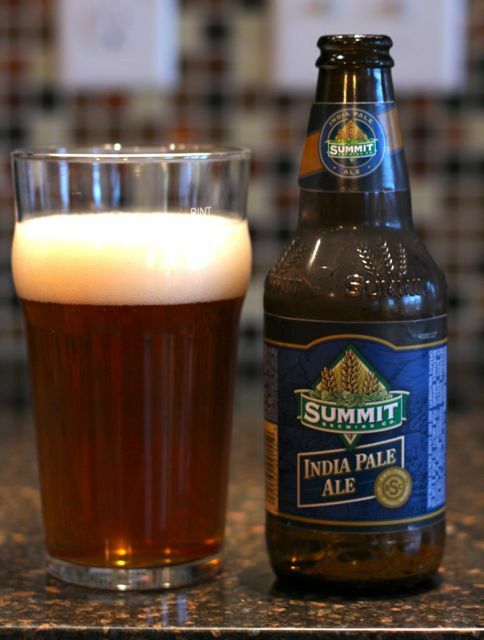 Along with New Belgium’s Fat Tire and Newcastle Nut Brown Ale, Summit’s Extra Pale Ale was a local craft beer that you drank on those occasions when Busch Light from a cobra tap was not going to cut it for some reason. Over time as I have widened my beer horizons and as the number of breweries has exploded in the U.S. 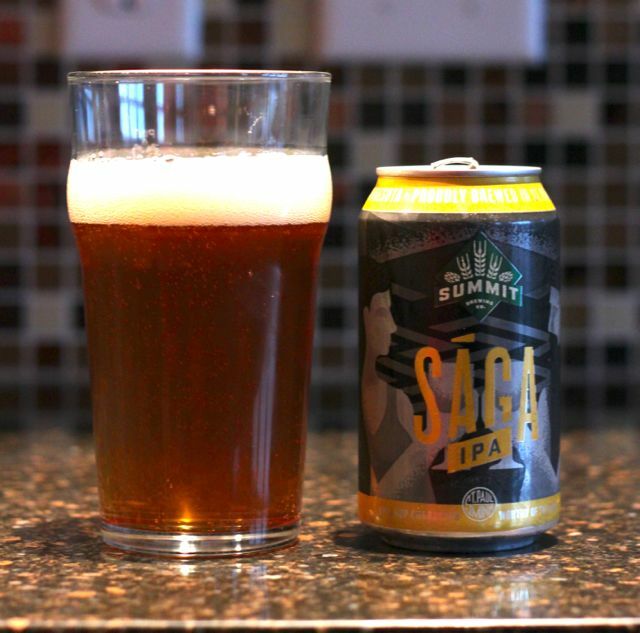 I have forgotten the great work being done by the long time craft brewers at Summit. Brewed as a seasonal in late winter, Frost Line Rye is a heavily rye focused beer—as opposed to beers that use a little rye—and it has a unique hop profile. Rye is said to give beers a spicy or peppery profile. I have brewed many extract rye recipes and used rye as a steeping grain. I have not, however, really noticed a pronounced spicy or peppery profile from these beers. Frost Line Rye did not have that flavor profile either. It was however dark, but not overbearing, with a unique body, attributable to the heavy rye influence, that was a nice springboard for the hops. Frost Line Rye incorporates three different hops in two different ways. Summit and Citra are employed traditionally in the boil to give the beer its bitterness, which at 55 IBU counters the 5.8% ABV nicely. Citra and a so-called Experimental Hop #01210 are dry hopped to really bring out a bouquet of hop aromas that would be lost in the boil. Citra is one of my absolute favorite hops to employ by dry hopping. I find that it actually loses a lot of its characteristics when used in the boil, which is something I am going to talk about when I discuss my latest attempt at a house ale recipe. 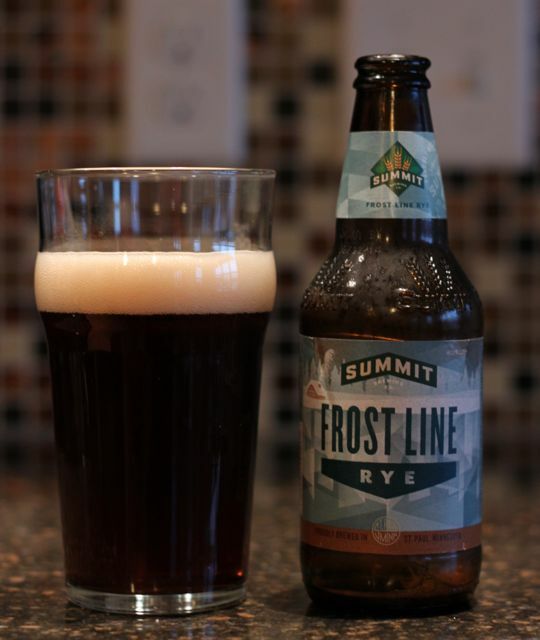 Overall, Frost Line Rye is a good beer that an aficionado of dark and hoppy will want to give a go. Apparently, India Pale Ale is no longer brewed and has been replace by True Brit IPA. All right. So, I either got an old six-pack of beer or I am drinking one of the last examples. Interesting. India Pale Ale pours like an IPA. What I mean by that is you get to see the copper orange color and in a moment the first hop aromas hit your nose. There is absolutely nothing unexpected with this beer. It is a textbook example of an IPA. The American IPA is synonymous with the rebirth of brewing and the growth of craft brewing in the U.S. It is wicked easy to understand why this style was such a departure from the pale golden swill foisted upon us by the macro-lager overlords. It’s thicker in body with an almost bread-like quality that lingers in your mouth while the hop aromas hit your olfactory senses full steam. After you swallow there is residual hop bitterness. Can you imagine what it was like to be the first people throwing down pints of a beer like this when the rest of the world thought that beer was a choice between Miller Lite or Bud Light? Michelob if you were feeling particularly rakish that evening. Like Frost Line Rye this is a well-done beer. After realizing my error in not grabbing Extra Pale Ale, which was the beer I remember drinking on summer nights during college, I know that I will have to make a return trip to the liquor store. I have brewed this exact recipe kit before, most recently last February when I chose to use Wyeast 1332 Northwest Ale in place Wyeast 1056 American Ale. The results of that batch were good, so I chose to brew a batch using a more traditional strain of yeast and see what happened. And? This is a beer that definitely benefited from an extra week in the bottles. The first bottle that I tried, not pictured above, was bottle conditioned for the minimum of two weeks. The beer was not heavily carbonated and the flavors were kind of sharp instead of melting together. It drank like a young beer. It is odd sometimes to think of beer ageing, but it is critically important to remember that un-pasteurized homebrew is a living organism. 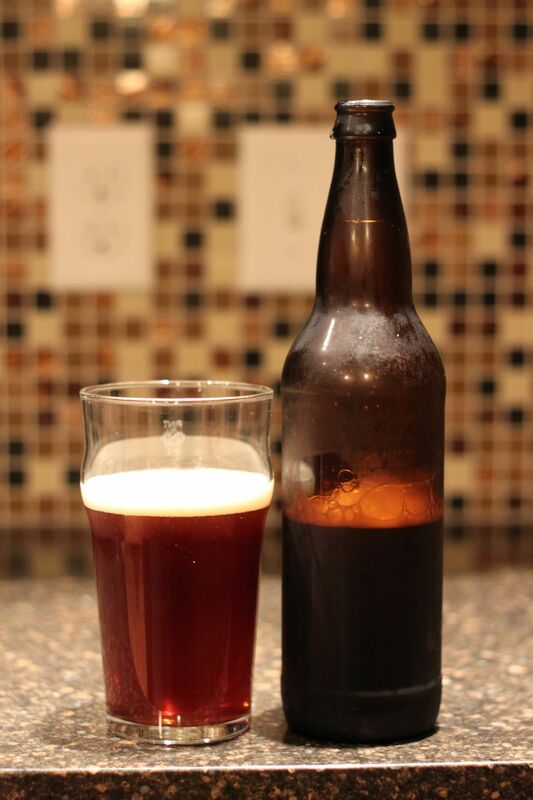 It is what allows the beer to bottle condition and it can dramatically change the flavor profile over time. Usually this ageing improves the beer. I waited an additional week to crack the next couple of bottles and was surprised by the difference. There was more carbonation, almost the perfect amount, and the malt profile no longer felt like it was trying to punch the hops out of the room. Some of the residual sweetness that was left on the tongue with the first bottle was totally gone. iBrewMaster figures that my American Amber Ale will be of both middling bitterness (~41 IBU) and alcohol (4.6% ABV). Both numbers feel about right for the beer that I let age additional week in the bottles, but the alcohol felt a bit higher across the tongue on the younger beer. Overall, this is an excellent example of a modern American craft beer and it is very forgiving for the average homebrewer to take on. It is my belief that amber ale and modern IPAs define the American craft beer renaissance. No two styles are crafted in as many variations by as many breweries with as dramatic a range of results. Partly this is due to just how versatile a base the basic recipe of either of these styles can be and the forgiving nature of the yeast, which seems amenable to just about any brewing condition unlike more temperamental ale strains. Do not even get me started on the prima donna yeast strains of the lager side of the house. Enjoy. Next up is a dry-hopped Chinook IPA that is bottle conditioning right now and a Scottish 70 Shilling that is bubbling away in a carboy which would make it ready for the Thanksgiving holiday. Bring on the cranberries. On Small Business Saturday following my trip to the NewBo City Market I made my way over to Benz Beverage Depot to see what looked good on the wall of beer. The little bottles from Peace Tree Brewing in Knoxville looked enticing. I have seen these little bottles in six packs at several stores in the area, but never pulled the trigger. What got me this time was that one of the seasonal brews—Cornucopia—was available. 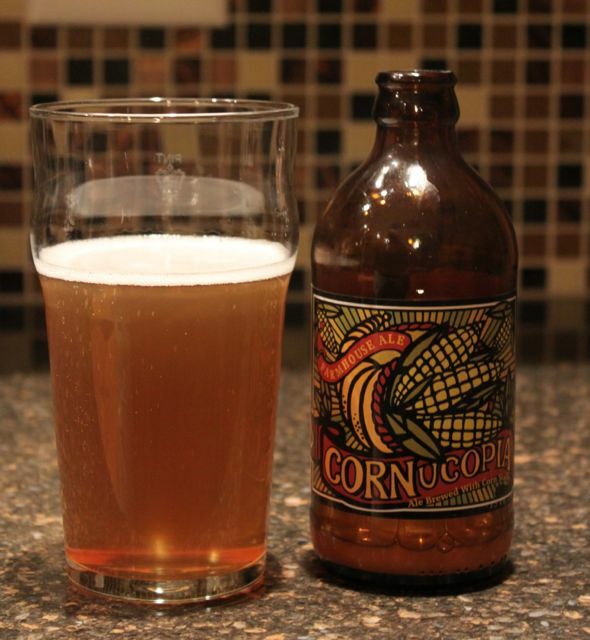 How can a good Iowa resident pass up a beer made with corn? So, I ended up with two six packs of beer: one each of Cornucopia and Hop Wrangler. Corn is considered an adjunct in beer and, in general, it gets a bad rap because it is associated with cheap mass market beers. However, if all we did as beer aficionados was follow the edicts of the Bavarian Purity Law (Reinheitsgebot)we would end up with beers that only contained water, barley, hops, and yeast. Corn is just another ingredient in the toolkit of the craft brewer. In this case the results are not promising for corn. Cornucopia comes across a little thin with minimal carbonation. I gave the beer the benefit of the doubt on the carbonation, but bottles two and three were no different. It’s not that I want a beer to be overly carbonated or bursting with artificial bubbles of carbon dioxide, but near flat beers seem to have less life to them in terms of flavor. Additionally, the beer is overly sweet without a balance of hop bitterness. Some people like their beer this way, but I would prefer more balance. It’s one of the reasons I have avoided brewing up a batch of either homebrew recipe from the White House. Too much sugar for my blood. This is what I consider to be a well-crafted American-style IPA. Before hop bombs and the obsession with going to the stratosphere in terms of IBU, the American-style IPA was about using non-traditional hops and new methods to break out of stereotypical molds. Obviously, this was in the early years of the craft beer movement and the frontier has moved farther afield but there is a place for a well-balanced American-style IPA. 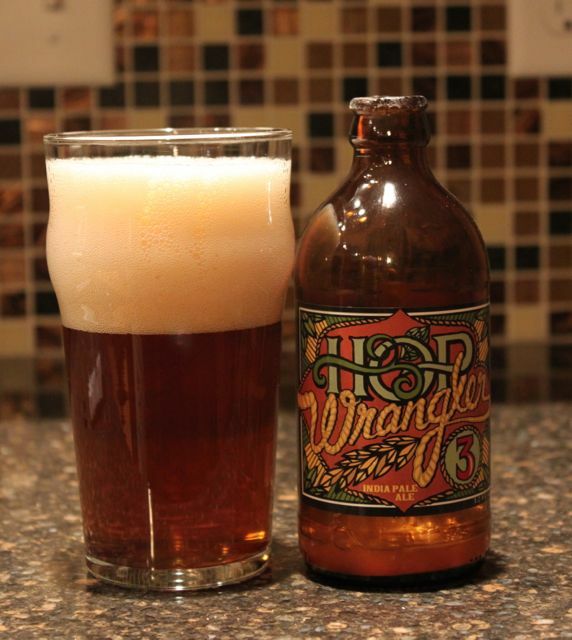 Hop Wrangler is dry hopped for aroma and you get a real whiff of that when your nose enters the glass. It is not overpowering by any means and the bitterness of the actual beer is not overpowering either so the effect is appreciated. Dry hopping is a nice touch when it is done to a level that is not like a punch in the face that is followed by a bitterness in the beer that is like getting strangled. Too much of a good thing is definitely possible when it comes to hops. Batting .500 is pretty good and it left me wanting to try what else the folks at Peace Tree Brewing are up to in Knoxville, Iowa. 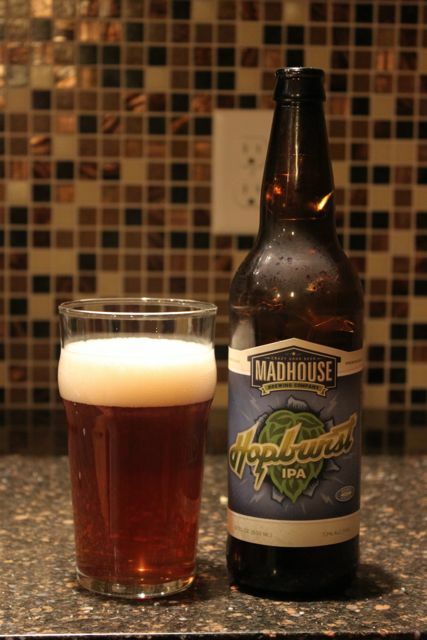 A while back I wrote about Madhouse Brewing’s Pastime Pale Ale and Honey Pilsner. 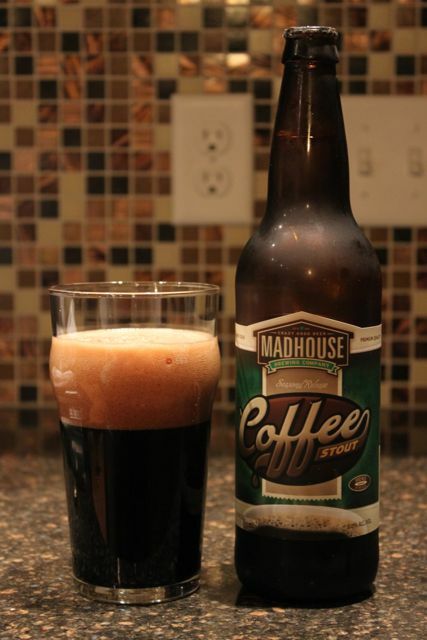 Now, Madhouse Brewing is back with Hopburst IPA and Coffee Stout. There is no doubt that this a very hop forward beer. The description says that the hops are added late in the boil, so there is not the smack you in the teeth hop aroma that you get from dry hopped beers–for better or for worse, you be the judge. The bitterness (55 IBU) and alcohol (7.2% ABV) are balanced by the malt base, so the beer does not come off as a one note hop explosion or burst, if you will. Nonetheless, this is a beer you pick up if you are looking for a very particular American style of beer. Moderate in alcohol (6.0% ABV) and right at the traditional level of bitterness for a stout (40 IBU) I found this beer to be very unappealing. The coffee flavor came across as “burnt gas station swill” rather than “coffee house excellent.” Thus, the beer comes across much more bitter than its IBU would lead you to believe. On top of the bitterness, the body of the beer was thin. Ugh. If you want to taste a beer that does a coffee addition right, get yourself up to Minneapolis for a Surly Coffee Bender.